It was early and the caffè was setting up. "Coffee," said the Wabbit. He said it again. "Coffee." Lapinette grinned. "It not going to come by itself." She heard the tinkle of crockery from inside. "Maybe it will." she shrugged. "Double espresso for me," meaowed Skratch, "No such thing," said Lapinette. She pointed at the Wabbit. He waved to a waiter dramatically. "Eight coffees in four cups!" "And rum," suggested Captain Jenny. "Bottle of Seven Fathoms!" yelled the Wabbit. Skratch sighed in a catty manner. "That was quite an adventure we just had." "But what kind of adventure was it?" smiled Jenny. Skratch pondered long and hard. "It was simply a delayed sequel, predicated on double aspectivity." Wabsworth knew all about this - and considered now to be the exact moment for his contribution. "We were presented as spatial things, spliced with our nuclear essence." "So where then, were our boundaries?" mused Lapinette. 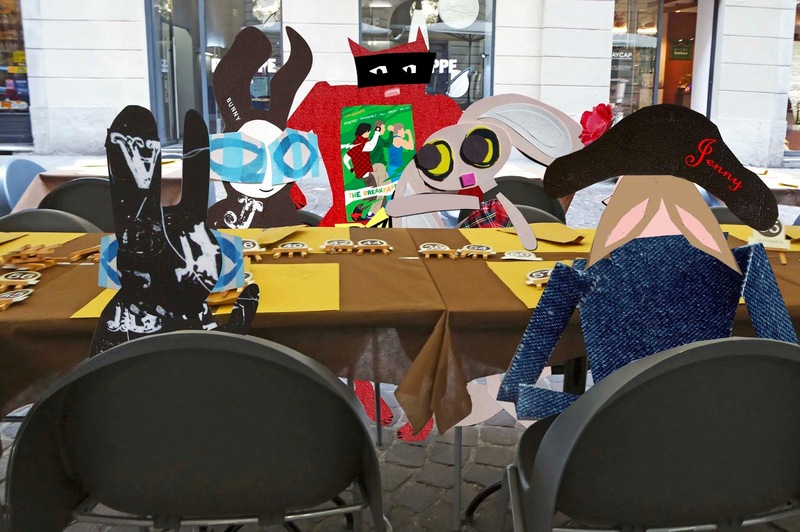 "There were no boundaries in that adventure," said the Wabbit, "All was fluidly sutured." "Talking of fluids," said Lapinette. "I think I can smell coffee coming." Jenny gave an enormous pirate shout and threw her shoulders back. "Splice the mainbrace!" "Splice it thrice," grinned the Wabbit.